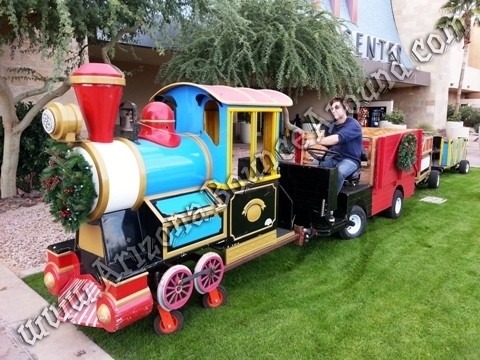 Rent a Christmas themed trackless train in Phoenix, Arizona for your next holiday party or event. It holds up to 20 people and has 3 lighted Christmas wreaths to fit the holiday theme just like the Polar Express. This train is perfect for riding around the park or neighborhood looking at Christmas lights during the holidays and it comes complete with lights on the train and in the wreaths. 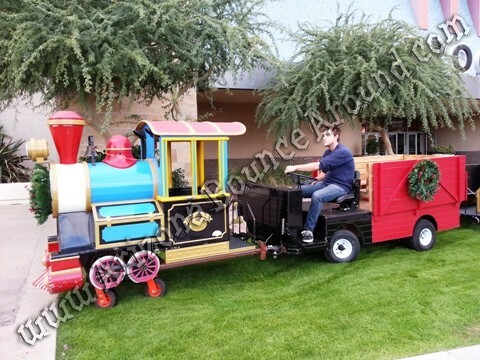 You can use it to shuttle people back and forth during your event so the uses are endless and everyone will have a great time riding the Arizona Experss trackless train. We can even mount TVs, snow machines or Christmas lights on the train by adding a small super quite generator. Our trackless train is fully electric so no noise or fumes from the train but the kids will be cheering and ringing the train bell so to say this train is silent will be wrong.